Utah amateur Patrick Wiggins discovered a possible bright supernova in the spiral galaxy NGC 6946 in Cygnus on May 13. If confirmed, 2017 eaw will become the 10th supernova found in this explosion-rich galaxy in the past century, reaffirming its reputation for fireworks of the grandest kind. Click here for high resolution. 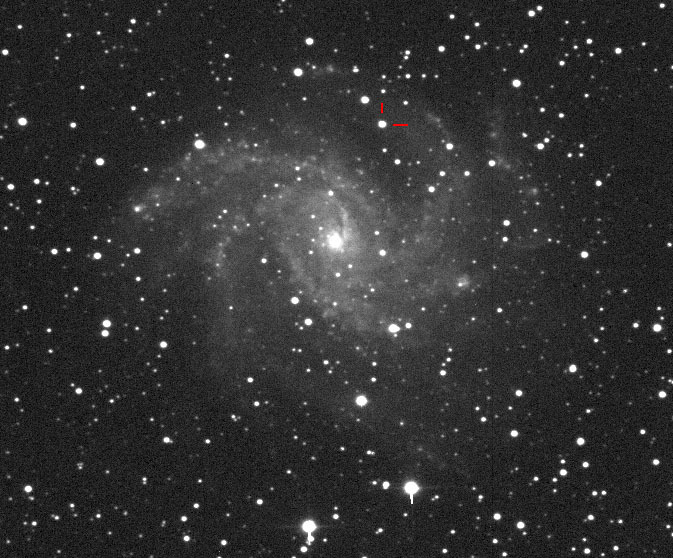 It was Wiggins’s third supernova, and he found it by comparing a CCD image made on May 14.24 UT through his 0.35-m f/5.5 reflector near Erda, Utah, with one taken several years ago and another from May 12th. Nothing showed on either image, leading him to suspect a supernova. To be sure, he watched the new object for over an hour to see if it moved. Faint asteroids have masqueraded as supernovae before, but this one didn’t budge. Italian astronomer Gianluca Masi did a check for known asteroids in the vicinity and none were listed. For the moment then, it appears we have a brand new stellar blowup in our night sky. Through a combination of good fortune and hard work, Wiggins happened to catch the star during the early stage of the blast. He estimated its magnitude at 12.8. Others have since confirmed the discovery and pinned the star’s brightness at 12.6. … The galaxy got its “Fireworks” nickname for all its supernovae. More supernovae have now been discovered here than in any other single galaxy.